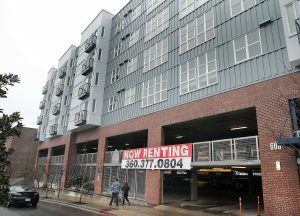 Why not convert Harrison Bremerton into affordable housing? 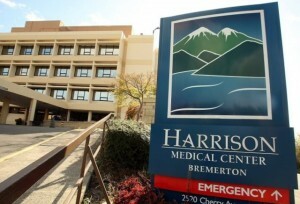 Harrison Medical Center’s consolidation in Silverdale will leave a 450,000-square-foot hospital vacant in East Bremerton three years from now. Harrison parent company CHI Franciscan Health is still determining if the building can be repurposed or should be torn down. 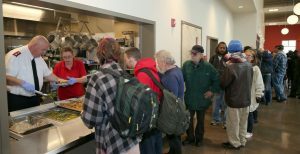 Given the looming affordable housing crisis in Kitsap, reader Kim Edgar in Poulsbo wondered if Harrison Bremerton could be converted into dorm rooms for Olympic College students or some other form of low-cost housing. “The rooms are large enough to be dorm rooms and they have their own bathrooms,” Edgar pointed out in an email. “Throw in a small fridge and a microwave and you’ve got a dorm room. They could convert the nurses station in to a common room, laundry room and a common kitchen area. 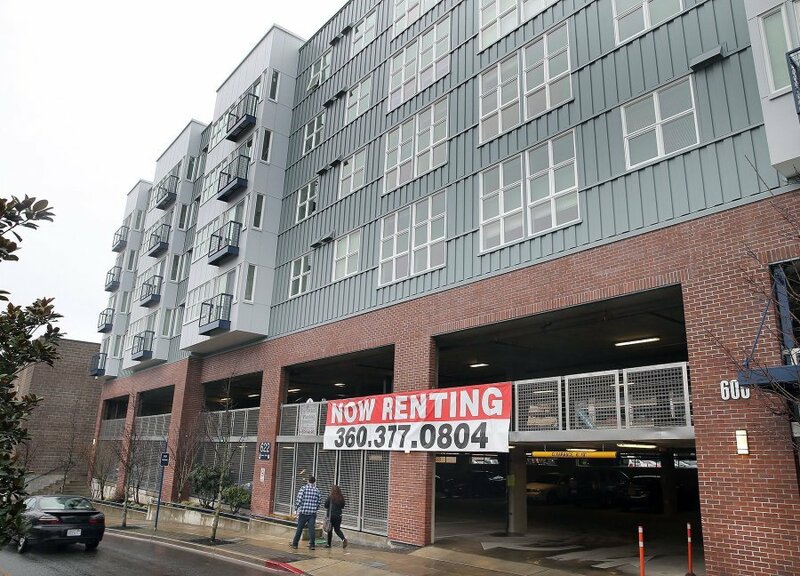 Edgar probably isn’t the only Kitsap resident eyeing the Harrison Bremerton building as a potential home for affordable rentals, so I asked Kurt Wiest with Bremerton Housing Authority if the idea sounded feasible. The Housing Authority has been interested in the site since Harrison announced its relocation plans. But Wiest said retrofitting the aging hospital into apartments would almost certainly be cost prohibitive. Since portions of the building were built decades ago, Wiest said there are likely hazardous materials like lead or asbestos present that would make residential conversion a complex and expensive prospect. Wiest believes there is potential to create housing at the Cherry Avenue campus if the hospital is demolished. Much will depend on what CHI Franciscan decides to do with the property. Have an idea for creating affordable housing in Kitsap? Drop a comment below or write me at tad.sooter@kitsapsun.com. There are 29 affordable housing units available for every 100 families living on extremely low incomes in Kitsap County. That’s according to analysis by the nonprofit Urban Institute, which compiled a county-by-county map illustrating the nationwide affordable housing gap. The map also shows the change in the affordable housing gap over time, with statistics from 2000 and 2006. 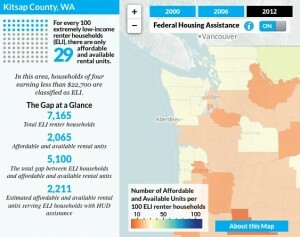 According to the analysis, Kitsap gained affordable units between 2000 and 2006, while the number of extremely low income households remained steady.The the number of low income households swelled between 2006 and 2012 but the county lost affordable housing units over the same period. 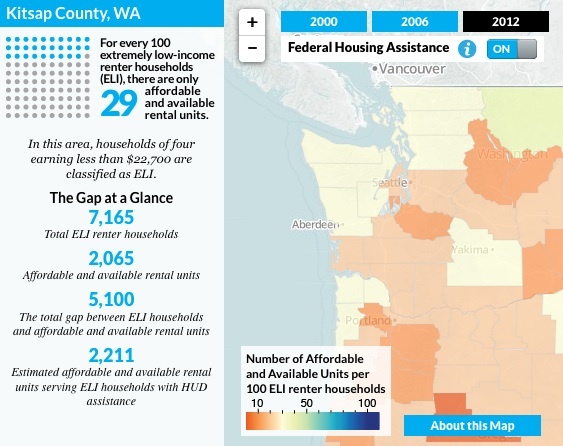 The current 29 units to 100 households ratio for Kitsap happens to also be the national average. No county in the U.S. has as many affordable units as extremely low income households according to the institute. The full map is embedded below, but it easier to navigate on the institute’s website.